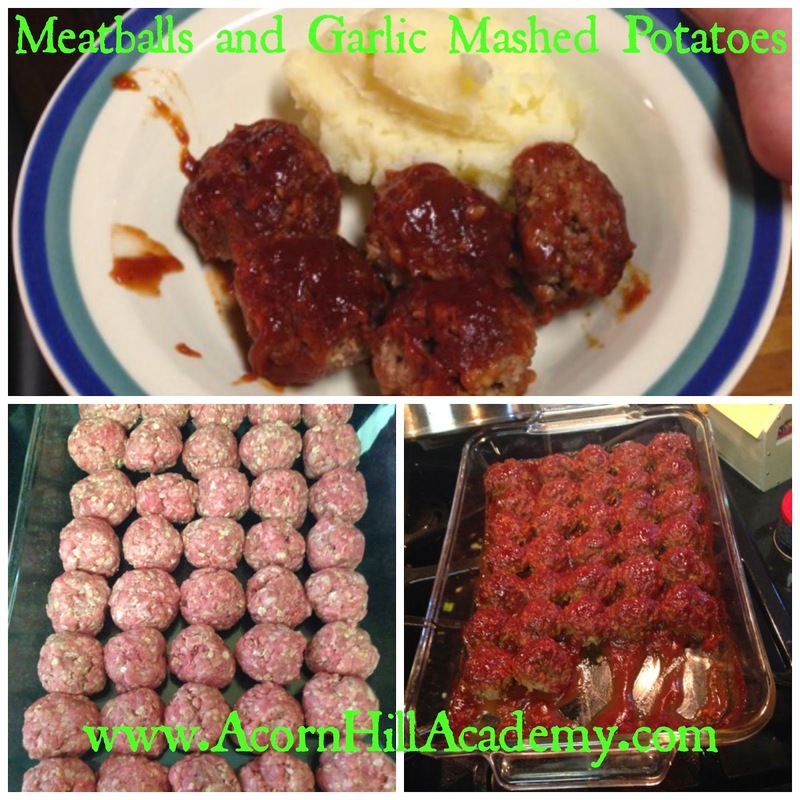 Acorn Hill Academy: REVIEW: Hey Mom, I'll Start Dinner Cookbook and GIVEAWAYS! 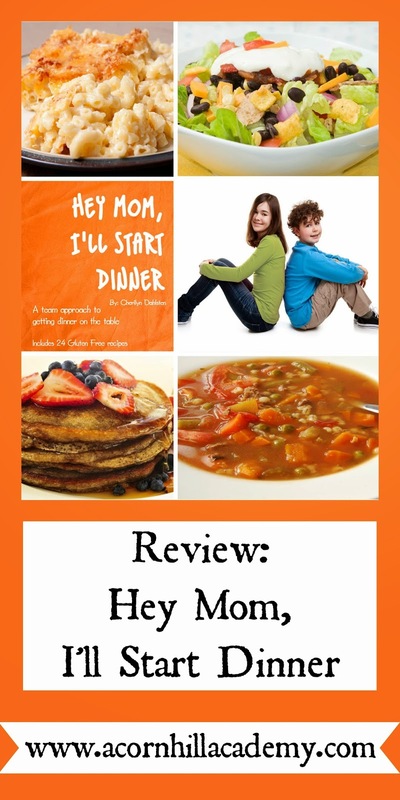 REVIEW: Hey Mom, I'll Start Dinner Cookbook and GIVEAWAYS! Be sure to read all the way to the bottom and enter the giveaways! I have not been good about teaching my children to cook. That's just a fact. I want to have them help me in the kitchen, but I don’t have a plan that allows me to do that most days. 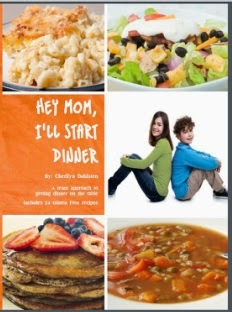 I was THRILLED, therefore, when a friend posted that her cousin, Cherilyn Dahlsten, had written a cookbook for kids entitiled, “Hey Mom, I’ll Start Dinner,” and even more excited to review it! Cherilyn is a working mom of four boys. She created this cookbook using recipes she tested on her own family, and each one is something they like to eat on a regular basis. Her passion is not cooking, but raising confident, unselfish kids who contribute to the family. This cookbook is one tool in our parenting toolbox to achieve that. The cookbook is a large format paperback, 8.5"x11", but not terribly thick. The recipes are color-coded by difficulty with color pictures, and include a bit of everything: main dishes, soups, side dishes, and desserts. There are also full-color pictures of the kitchen tools used in the book so children can figure out what they need independently. The instructions are written to the child, assuming they know nothing. There are also "night before" instructions where applicable, generally written to parents so you can be sure your child has what they need to make dinner independently. It will encourage you to plan your meals ahead, too, so that you have the ingredients on hand for the recipes you want them to make. The first recipe we tried was Chicken Pot Pie. Abbie (age 13) made it one night when I wasn’t home, so no one took pictures. She was a little offended by how easy it was to make, which made me laugh! It was quite tasty, though, so I know it’s something we will have again and I can have either of the girls put it together and pop it into the oven. We had it again during the review period, and my older daughter made it with the same tasty results. I had Emma make Meatballs and Garlic Mashed potatoes, and they were excellent. We chose to use oatmeal instead of bread crumbs in the meatballs, Abbie gave up bread for Lent, and it did seem to give them a slightly different texture, but they were still good. There were NO potatoes left after dinner and we willingly ate the meatballs as leftovers. 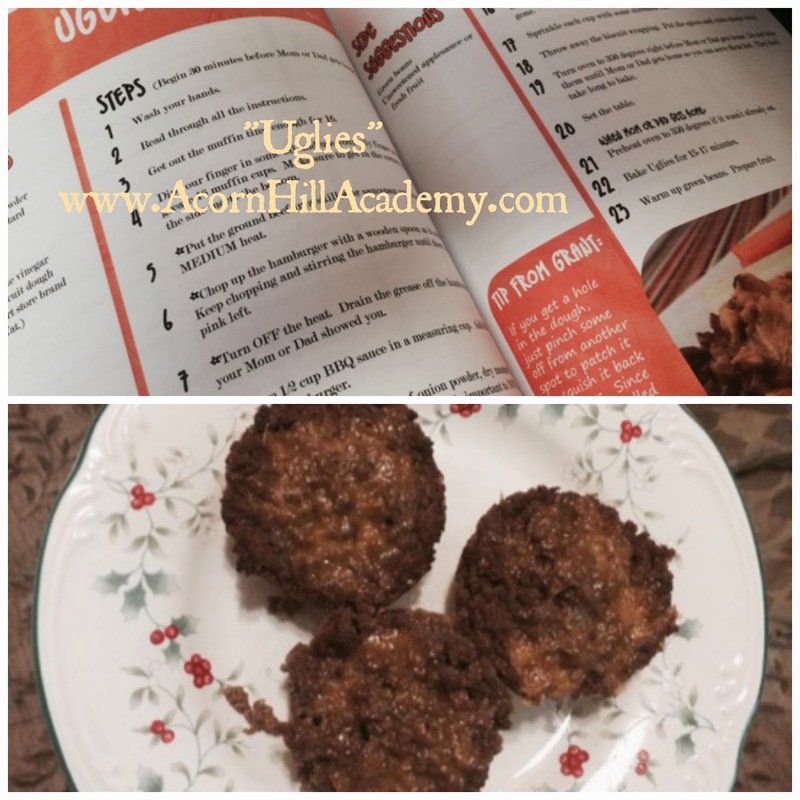 Abbie just could not decide what she wanted to make next, so I assigned "Uglies," just because I thought the name was fun. They turned out really well too, and were gone by the next day. I kept hearing, “Who ate the rest of the Uglies?” Abbie requested that I get more barbecue sauce (between the meatballs and the Uglies we used all I’d bought) and biscuit dough so she could make them again, and they were just as tasty the second time - maybe even better because I got better barbecue sauce. 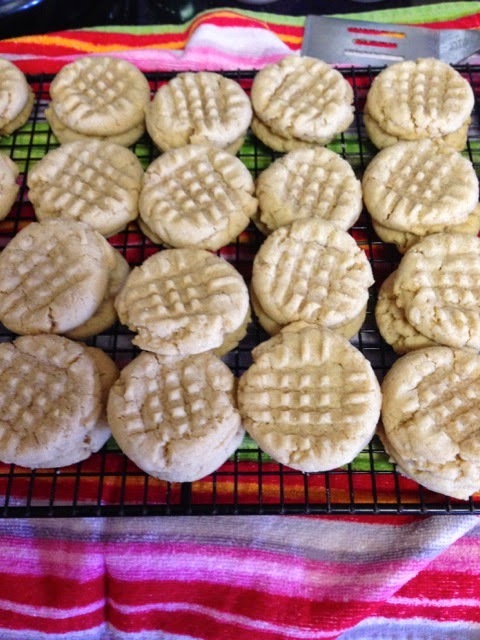 Abbie also made peanut butter cookies. The girls have been making cookies weekly since last summer for their dad to take to work, so are good judges of recipes, and found Cherilyn's to be easy to follow. The received the "Cookie Wednesday Seal of Approval" from the folks at my husband's office, too. Although Isaac isn't reading on his own yet and is just 6, I am planning to go through this with him as well. He is certainly capable of chopping things and getting started learning alongside me when I cook, which will make it that much easier when he's old enough to take a turn making dinner too. I really, really love this book. Love it. It gave me simple plan (key word: simple) to get my kids in the kitchen, both with and without me, so they know how to feed themselves when they eventually leave home. It's been wonderful to hand dinner prep off to someone else now and then. My girls might not show a great deal of enthusiasm when I ask them to cook, but I can see the pride they take in their accomplishments when we eat what they've made. We're going to use this book often, and I can see it being especially useful this summer, when I will be gone more than usual to conferences and on a trip with Abbie. My peeps at home will have a greater variety than macaroni and cheese and spaghetti in their diet. The cookbook is available through the Hey Mom, I'll Start Dinner website, and Amazon.com (aff. link). You can also see sample pages at HeyMomIllStartDinner.com. Be sure to connect with Cherilyn on Pinterest, Facebook and Twitter. And don't forget to check out her blog, where she shares recipes and tips! Enter to win an ebook copy of Hey Mom, I'll Start Dinner! Enter to win one of three fabulous prizes! I don't cook at all and I know I need to start doing a lot better but it's hard. So this super simple is what I need! This sounds like a great cookbook. My 4 girls love to help in the kitchen anyway and the older ones have prepared a meal or two. This seems like it would give them an opportunity to be independent as well. Awesome. This sounds like a great cookbook for my girls to use in the kitchen to not only make a meal but to exercise some independence. Awesome. Seems like an awesome idea for a cookbook! Love the idea behind this cook book. Thank you for sharing your thoughts on it! I need to do a better job of including my kids in the cooking - I generally prefer to just get it over with and feed them instead. This cookbook sounds like a great way to get them cooking more!